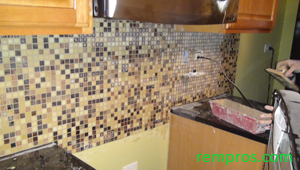 It is pretty facile to tile backsplash by yourself and watching discursive video how to tile a backsplash in addition with illustrations will help you undoubtedly perform simple tile backsplash installation by self. 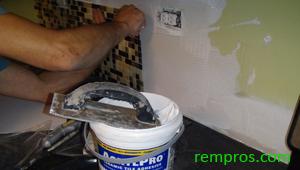 In some cases you will need to have a grinder with a sand paper to polish tile sides while installing tile backsplash. 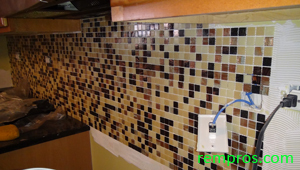 If you are planning on installation of a tile backsplash the surface needs to be flat, otherwise all imperfections and bumps will be visible especially on thin mosaic tile. 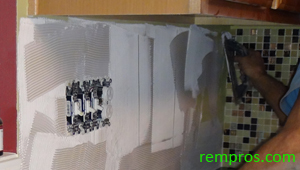 After replacing a co untertop the wall behind counter backsplash might be damaged during demolishing and needs to be fixed with a sheetrock compound. Shut off the power to electric outlets and switches on the area you will be working. Take out plates and loose actual switches and outlets the way tile will go under their edges. If the backsplash tile is thick unscrew them completely and after tile installed use a longer screws reinstall all of them. Plan well from where and how to start tiling the backsplash. Measure the length and heights of kitchen backsplash area, than measure the actual tile you are planning to install and how it will look on a backsplash. In some cases it is better to start from the most visible side and go to the corner where to make cuts. Sometimes, especially with a bigger tile it is better to start from the middle of kitchen sink or oven and go on the sides. The dimension of the tile and actual backsplash area will lead to the answer from where to start and how to go with a tiling of a backsplash Before starting on tile installation remove oven and fridge so they will be not on your way. Remember to go with a tile a little deeper behind the fridge and oven the way all visible areas will be tiled. 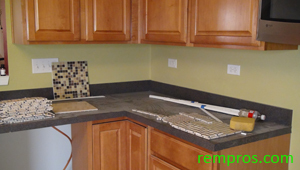 Using a trowel with a 1/8 apply wall tile adhesive on the wall and set a backsplash tile. If the walls a not that flat and the tiles are bigger sizes you can apply the mortar directly on a separate ties. All the times read manufacturer recommendations how to apply adhesive properly if you are not sure. If there are a separate pieces of tile put the spacers in between the tiles. If it is mosaic tile on the mesh – insert tile spacers in between separate meshed units. All the time pay attention to the level of tile backsplash installation. 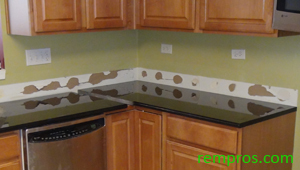 After all backsplash tile installed – leave it for a while to let the glue dry. Take out all spacers left in between tiles after installation. Mix the grout and apply it in between the separate tiles with a grout float. After tile grout is applied wash out all remains from the tile backsplash with a water and let it dry. Some tiles will require sealing after installation. Next step is to reinstall all electric outlets and switches including cover plates. While installing ceramic tile backsplash you can use hand tile cutter to cut the tile. If it is any stone tile or glass mosaic tile you have to use a good wet tile saw. The edges of stone tile can be polished with sandpaper on a grinder wheel. Should I install backer boards on the backsplash area prior to tile installation? If it is a drywall wall it is not necessary to change it for a backer boards or Durock cement boards, and you can tile a backsplash over existing drywall. But if there are no drywall yet installed you can put a cement boards instead of drywall. Which glue I should use for tiling kitchen backsplash? 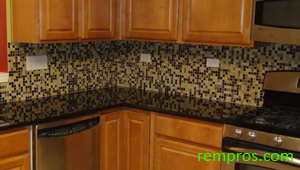 There are no specific glue requirements for installation of a tile backsplash. Choosing the proper glue will depend on a type of tile will be installed. Ceramic tile mastic multi-purpose adhesive might be used for most backsplash tile installation.